With most of the industrialized world focusing on all things European, we thought it might be worthwhile to see just what was happening on the other side of the Ural Mountains. Asia has not become embroiled in the debt problems sweeping through the likes of Greece and Italy, and its exposure to the euro is contained. However, what happens in Europe will inevitably drift into Asia, so a look at its major economies might provide insight into what awaits the region in 2012. In particular, we are focusing on the two most populous countries in the world – China and India. At the beginning of this year, China’s attention was on containing rapid credit expansion and a real estate market most people felt was overheating. India’s problem was inflation, aggravated by supply bottlenecks and an unpredictable monsoon season. Neither economy placed a high priority on events in the Euro-zone at the time. 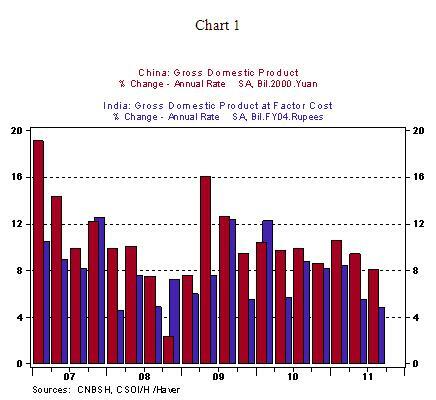 But 2011 has been a prime example of just how much things can change over the course of a year, and economically, this applies for China and India. 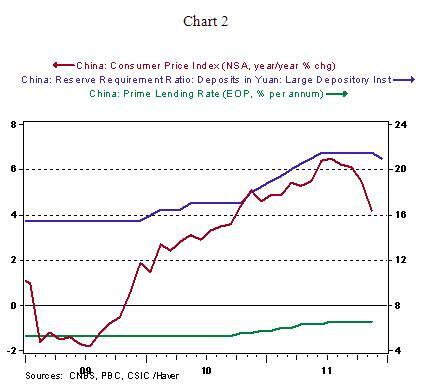 The People’s Bank of China (PBoC) began its monetary tightening phase in January 2010 but accelerated it in the beginning of this year, ramping up the reserve requirement ratio to a record 21.5% for large institutions and raising the more sensitive prime lending rate by 95 basis points – all in the first half of the year. This was supposedly a containment of inflation and credit growth and not a response to a growing asset bubble, and this was generally accepted once price increases moderated. However, as the Euro-zone economies slowed and China’s exports to that region tapered off, the PBoC changed its bias. The Bank declared that the fight against inflation was won, and it eased reserve ratios. We believe the justification was not that simple. Contrary to popular belief, the European Union imports more Chinese goods than the US does (19.7% of the total versus 18.0%), and therefore China is that much more concerned about events in the EU. It has not been a coincidence that Beijing officials have offered widely-publicized financial support since 2009 to troubled EU economies and purchase significant amounts of debt. Now it appears that PBoC policy is becoming accommodative to offset an expected Euro-zone recession in 2012. As the situation in the EU progresses, and possibly worsens, policy measures from Beijing will reflect its increased concern. India, however, is another story. The world’s largest democracy had been posting growth figures around 8% at the beginning of the year with inflation coming down from the 16% high at the beginning of 2010. However, price pressures were building as a poor agricultural season fed into supply shortages. Furthermore, a deceleration of money supply growth suggested the economy would be slowing down as the year went on. The Reserve Bank of India (RBI) was caught between fighting inflation or promoting economic growth, and while it opted to pursue price stability, its approach was insufficient. The economy slowed down, but prices rose back above 10% and the RBI had little enthusiasm for cutting rates. Going into 2012, India needs some outside help to promote growth. We question whether it will arrive. Even in the best of times, exports only account for 25% of India’s GDP, versus the 50%+ seen in the more export-oriented regional economies. Europe is not a major trading partner, but rather the US and countries bordering the Indian Ocean. This steers India’s trade clear of the Euro-zone’s problems, and the economy may even benefit from increased regional trade, but as mentioned before, exports do not have the same impact on the economy as they would in China. 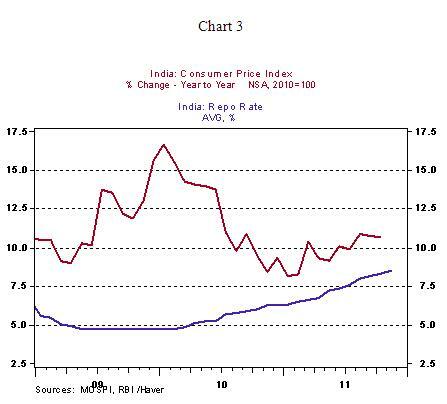 Rather, India’s growth and price stability both depend on domestic balance, particularly with regard to food. This year’s monsoon season fell below expectations, so combining this with slow money supply growth and rising prices, we believe that the economy will struggle to post 4% growth through the first half of 2012. And if inflation does not come under control during that time, that below-potential growth rate could last the entire year. Also important to the outlooks of both countries but far more difficult to forecast are the countries’ exchange rates – also heading in opposite directions. The Chinese yuan closed out last year at 6.62/US$ and has appreciated slowly throughout the year, though its strengthening is far from what its trade partners would prefer. The Indian rupee, however, has lost ground throughout the year, and dove precipitously since the beginning of November. For both countries, 2012 will need to be a year where their currencies move more in line with fundamentals. This suggests the yuan should appreciate more rapidly (which is highly unlikely if the export economy is adversely impacted by the Euro-zone’s woes), and the rupee should rebound (which will first require controlling inflation). Without these corrections, both economies will be vulnerable to problems in the global economy, and undoubtedly some problems will come from Europe. James Pressler is an Associate International Economist at The Northern Trust Company, Chicago. He currently monitors emerging markets in sub-Saharan Africa, as well as several European and Asian countries.